"Hearing impairment" or "hearing loss" is thought to be a consequence of age, but from an up-to-date investigation, it became clear that there are other causes other than age. While in China, they believe that the hearing function has something to do with smell. Do you know that the sound of music you hear may be different when heard by others? Why will it be heard differently depending on the person? Suppose that before we play music, we inform the listeners that there shall be a word or noise saying "New York, New York", and ask the listeners how many times they heard it? Probably 70-80% of them will say, "Yes, yes, we heard that". But then, there was not even a word "New York" at all but we just inserted scratching noise. From this experiment, we understand that the Chinese was right to say that the hearing function has something to do with smell. We really do not hear sounds by our ears alone. We hear sounds both by smell and vision, too. Our brain is made to fill up the portions where objects are blank or hidden. Now let's take another case. Let's say you saw a bomb blasting photo and you did not hear any sound. But by means of seeing the blasted bomb, you will imagine a "Big Bang" or illusion of sounds that exists in your brain. The brain recalls or restores the sounds lacking in the photo. You can call it "Phonological restoration". We also conducted experiments of hearing impairment with the elders and young people. 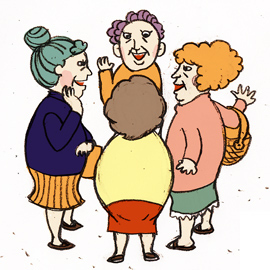 As expected, in a certain accustomed short Japanese words, the elders can hear more than the younger ones. However, English-related short words were heard by younger people. From this experiment, we truly conclude that hearing is not only by ear but by individual memories, too. Memories in the brain can repair or fix the part where sounds are not heard and remain blank. And they can understand it as if they heard it right. It's just like the illustrations below. 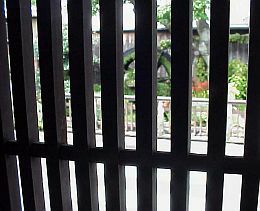 The sights are obstructed or blocked by lattice doors or windows. Yet, you can imagine the unviewed portions and repair it to see or imagine the entire sight. It is just the same with the hearing function. The way this repair capability works varies on the subject among young and old people. Although it is true that the hearing function weakens with age, there are ways to restore it artificially. Also, there are elders whose hearing function is greater than young stars. 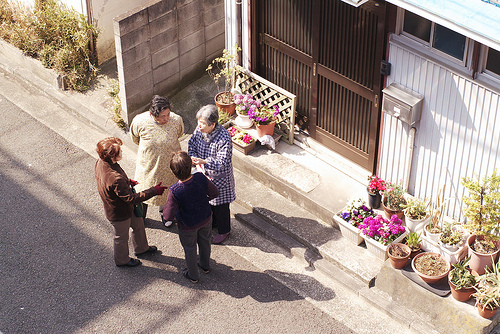 Do you notice that elderly people can gather easily and talk to each other and gossips go around without end? There appears to be no problem of hearing loss among them. Why? It is because when the subject of their conversation is favorable among them, they can fix or repair unknowingly where they were not able to hear by means of action or movement of each lip. 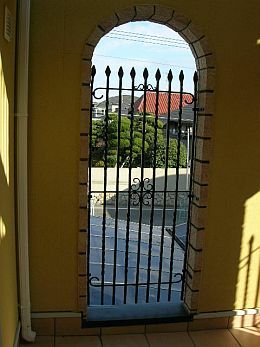 It is just like the grill window illustrations shown above. Of course, it is true that when most of us get old, our hearing senses deteriorate due to hardening of eardrums. Well, what is the main reason of hearing loss? Our studies show that there are many elderly who have good hearing just like young people. We tried to analyze more conclusively on what can cause hearing loss. At first, we came to understand that people who have hyperlipidemia (excessive fats in blood), diabetes, and kidney disease are more at risk of hearing loss or deafness. In the case of hyperlipidemia, cholesterol deposits form on the inner surfaces of the arteries obstructing blood flow, and will easily clog the capillaries in the ear. In addition, diabetes can cause raised capillary pressure. And when kidney function fails, the ability to discharge the wastes that formed in the ear capillaries will also fail. Improvement in lifestyle such as moderate exercise and healthy diet will help prevent hearing impairment or deafness. There are families that have misunderstanding or troubles among the elderly and young generations even in various companies because of hearing loss. Try to make subjects to talk about at the same level with young and old generations. 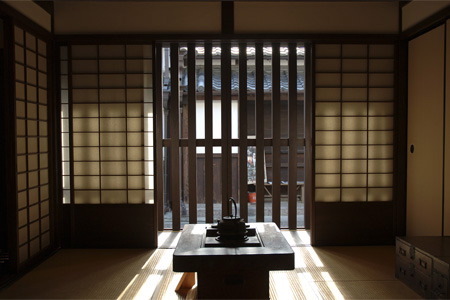 In this way, you can avoid frequent misunderstandings or misinterpretations from each other. Let's start just like gossip-gathering. Daily simple exercise can at least prevent healing loss. We recommend exercises such as that shown here: https://www.pyroenergen.com/articles/heart-attack.htm and https://www.pyroenergen.com/articles07/varicose-veins.htm.